C'mon try them. Green eggs are cool! Anyone who knows me will tell you....... I love this School!! In my heart I know that this job, and all who are affiliated are a gift, one that has changed my life. Perhaps that's the reason I always find myself amazed and delighted by the "common" things that are sometimes overlooked, expected, or simply taken for granted in our incredibly hectic world of education. This week, (Dr. Seuss Week), I had the privilege to observe the wide eyed excitement of some very happy first grade students. Proudly donning tall red and white top hats, they smiled with glee as they absorbed all their newfound knowledge of America's very own beloved writer and cartoonist, Dr. (Theodor) Seuss. Now trust me when I tell you.... attaining the delicate balance of this much learning, and that much fun, is no small feat. This is just one of the many reasons I admire our teachers so much. It takes super human energy, boundless creativity, and a pretty generous pocketbook to perpetuate the type of learning environment that's being generated here.. I love this school.....but more importantly, so do our kids. If you don't believe me, come see for yourself. 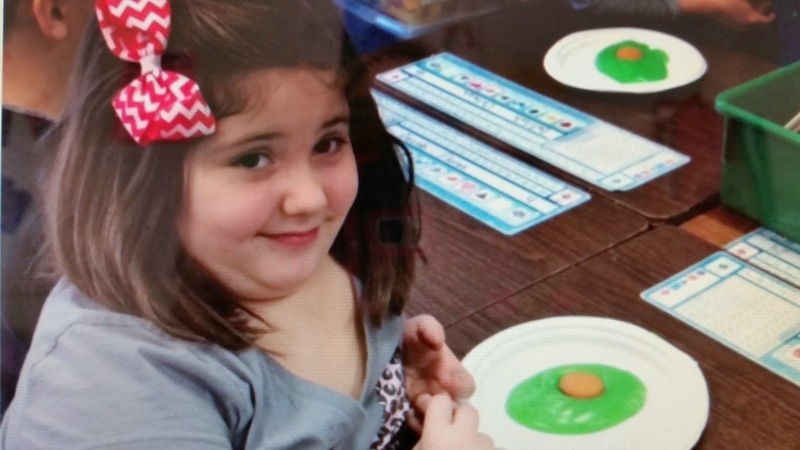 And if you're lucky, Mrs. Power's class might my just whip you up some of their famous, super- duper delicious green eggs. So much fun! I bet your kids LOVED this! Awww- love this! And you are one of the reason this school is so great! I absolutely love that little girl's expression. I can relate to loving my school and working create a place the kids love too! Yummy looking eggs! Your students are fortunate, and I hope they love their MS and HS when they grow into those grades. What a wonderful Slice, Darlene! I love the line: I love this school.....but more importantly, so do our kids. I hope lots of our teachers read this today. The face of the little girl in this picture says it all! You are in the perfect place - they are lucky to have you and you are lucky to have them. No doubt about it!